Deborah Lee James, former secretary of the U.S. Air Force, has joined Bain & Company as a special advisor in the consulting firm’s Washington, D.C. office. Bain said Thursday James will advise aerospace, defense and government services customers and work with the firm’s local leaders to establish relationships with “high-potential” individuals and companies. 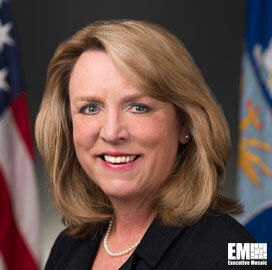 “Deborah brings to our team deep technical expertise in defense and government services, as well as extensive leadership experience, both of which will be critical in helping our clients address some of their toughest business challenges,” said Phil Kleweno, head of Bain’s Washington, D.C. office. James worked at Science Applications International Corp. (NYSE: SAIC) for more than 10 years in leadership roles such as president of the technical and engineering sector; executive vice president for communications and government affairs; and director of homeland security. She previously served as the assistant secretary of defense for reserve affairs in the Pentagon under the administration of Bill Clinton. The more than 30-year national security and defense veteran also served as senior adviser to the House Armed Services Committee’s Military Personnel and Compensation Subcommittee, the NATO Burden Sharing Panel and the Chairman’s Member Services team. James is also a member of MIT Lincoln Laboratory’s advisory board; a senior adviser at the Center for Strategic International Studies; and a future member of Textron‘s (NYSE: TXT) board of directors, effective July 1. Tags Air Force Bain & Company Center for Strategic International Studies CSIS Deborah Lee James featured govcon House Armed Services Committee Military Personnel and Compensation Subcommittee MIT Lincoln laboratory NATO Burden Sharing Panel Phil Kleweno SAIC Science Applications International Corp. textron TXT U.S. Air Force USAF washington d.c.